The Grammarly Editor has reviewed thousands of essays, term papers, and short stories from students of all ages. 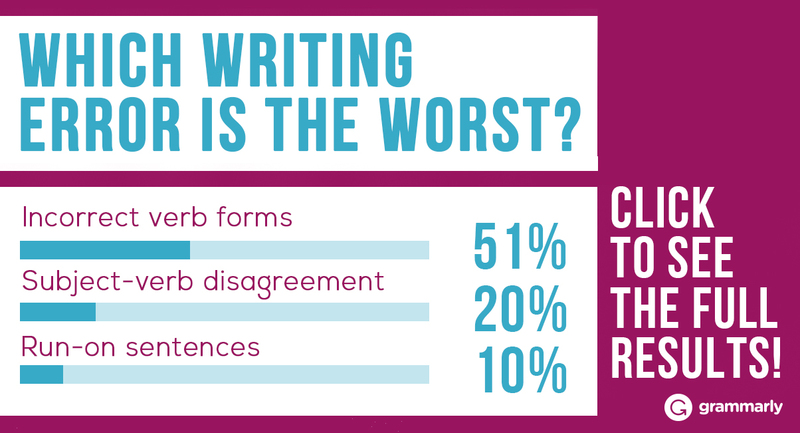 As a result, we’ve been able to collect data on the most common types of mistakes that student writers are making. 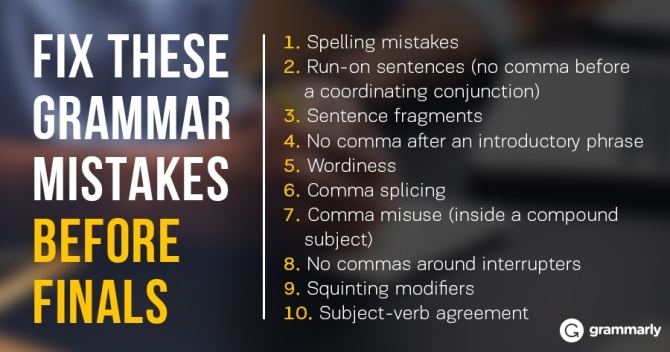 As finals season approaches, take a look at the errors on the list below to brush up on your spelling, grammar, and punctuation. Good writing habits will not only serve you well in school, but written accuracy benefits professionals throughout their careers. Many spelling mistakes occur when incorrect homophones (words with the same pronunciation, such as “right,” “rite,” and “write”) are used in a sentence. Watch you’re words! Spell-check may not sea words that are miss used because they are spelled rite! Watch your words! Spell check may not see words that are misused because they are spelled right! A coordinating conjunction connects two clauses that could be sentences on their own. You can use the acronym FANBOYS to remember the most common coordinating conjunctions: for, and, nor, but, or, yet, and so. Unless the clauses are very short and closely related, you need a comma before the conjunction. If you forget to put a comma before the conjunction, it becomes a run-on sentence. My dog barks at the mailman but she’s too lazy to chase him. Solution: Check to see if the clauses before and after the conjunction could be sentences on their own. If so, insert a comma before the conjunction. My dog barks at the mailman, but she’s too lazy to chase him. A sentence fragment is a sentence that’s missing a subject (the thing doing the action) or a verb (the action). Solution: Add a subject or verb to the fragment, as needed. An introductory phrase provides some background information and is usually followed by a comma. The comma is optional when the phrase is very short. While a Thanksgiving commercial played on the TV she was at the library trying to study for her final exams. While a Thanksgiving commercial played on the TV, she was at the library trying to study for her final exams. At long last I made it home. OR: At long last, I made it home. A sentence is wordy if it uses more words than necessary to convey meaning. Wordiness often makes writing unclear. Solution: Identify long phrases that can be replaced with a single word. Eliminate words that have the same meaning. Eliminate weak words, such as “basically” and “sort of.” Eliminate nonessential information. A comma splice occurs when you use a comma to connect two clauses that could be sentences on their own. He bought back-to-school clothes, his mom bought a scarf. Solution: Add a coordinating conjunction (remember: FANBOYS) after the comma, or change the comma to a period, semicolon, or colon. He bought back-to-school clothes, and his mom bought a scarf. OR: He bought back-to-school clothes. His mom bought a scarf. A compound subject uses a conjunction to connect more than one noun phrase. My roommate, and his brother, went to see a movie. My roommate and his brother went to see a movie. Interrupters are phrases that break the flow of a sentence to provide additional detail. Put commas around interrupters. It was unfortunately the end of winter vacation. It was, unfortunately, the end of winter vacation. A squinting modifier is a word, phrase, or clause that could modify the word before it or the word after it. Students who study rarely get bad grades. Solution: Put the modifier next to the word it should modify. Students who rarely study get bad grades. OR: Students who study get bad grades rarely . Michael study at the library every day. Michael studies at the library every day. There you have it: the top ten student writing mistakes, just in time for finals. The writing skills that come from identifying common errors will help you make clearer points in your writing now and in the future. I encourage you to print out this post and take it to class with you next semester. You never know when a teacher might assign you a back-to-school essay on the first day. Happy writing and stay tuned for more tips designed to take your writing to the next level!